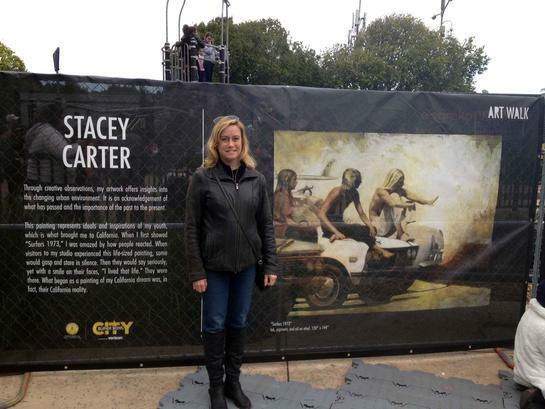 The painting "Surfers 1973" by STacey Carter is on display at Super Bowl City San Francisco as part of Art Walk - a collaboration between the Super Bowl 50 Host Committee and Artspan. Art Walk is designed promote and display the work of local Bay Area artists to the hundreds of thousands of visitors coming to downtown San Francisco for Super Bowl festivities. The exhibit is staged on the perimeter fencing of Super Bowl City presented by Verizon, the Super Bowl 50 Host Committee’s free-to-the-public fan village. 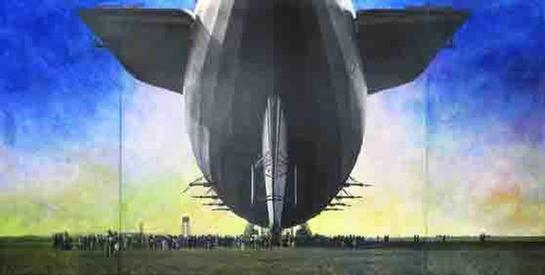 New Museum Los Gatos presents Giants in the Sky: The Rise and Fall of Airships. The exhibit opens June 6 and runs through September 27, 2015. This multimedia, interactive exposition includes contemporary artwork, vintage photographs, artifacts, memorabilia and video. In the early 20th Century airships became both a promising technology and an exclusive mode of luxury travel, but it lasted just one generation. During this golden age of air discovery, Moffett Field was home to the great airship USS Macon, becoming the birthplace for scientific, technological research and development. The story of airships explores the quest for aeronautic innovation, its infusion into popular culture, and the rise and fall of a technology that continues to capture our imagination. San Francisco artists Jenny Robinson and Stacey Carter, and California painter Michael Rosenfeld, illustrate the scale and grandeur of these superstructures. Contributions from The Museum of Monterey, AirshipVentures and the private collections of Robert Flynn Johnson, Curator Emeritus of The Achenbach Foundation FAMSF and Cheryl Ganz, Curator Emerita of The Smithsonian Philately Museum feature ephemera, photographs and objects providing historical context. This exhibition is made possible by the generous support of our partners, lenders and sponsors: The Town ofLos Gatos, Moffett Field Museum, Museum of Monterey, NASA Ames Research, Airship Ventures, Sierra Toy Soldier Company, Jamis MacNiven and Buck’s Restaurant, Robert Flynn Johnson, Cheryl Ganz, the Artists and Donors to NUMU’s Annual Campaign. Artists, Museum Curators, Hangar One at Moffett Field and a re-invented new museum brought together by a fascination of airships . . . Engaging community at the intersection of art, history and education through innovative, locally connected and globally relevant exhibits, programs and experiences. 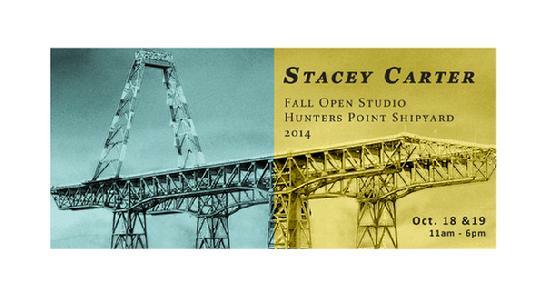 Hunters Point Shipyard Artists, America’s largest artist colony with more than 280 artist work studios, and the Bayview Opera House, have teamed up to present the 25th Anniversary Spring Open Studios. This event, which takes place from 11 a.m. to 6 p.m. on Saturday and Sunday, May 3rd and May 4th, showcases 125+ exhibiting artists from seven Shipyard buildings and Islais Creek Studios. with works in a sweeping range of styles, mediums and subject matter, offering a slice of contemporary art culture in two settings. presenting elevated waterways and imaginative landscapes. More About the Hunters Point Shipyard Artists In 1976, a private ship repair contractor leased the yard from the U.S. Navy and sublet buildings to civilians, including The Point’s founder, Jacques Terzian, whose family business fabricated found-object based furniture and wall installations. In the early 1980s, Terzian saw the possibility of transforming neglected buildings into affordable work spaces for artists, and The Point soon became America’s largest artist colony and the authentic home to San Francisco’s visual artists, musicians and writers. high-quality arts education, cultural programs and community events in a safe environment. Images copyright © Stacey M. Carter 2018. All rights reserved.